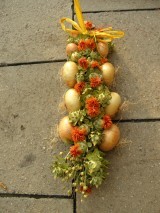 Also known as the Onion Celebration it originated in Germany and inspired the town of Hořovice to create their own. The Onion Fair is not only a fair with onions, typical of most fairs you’ll find everything here. Carousels and attractions for kids, household goods, goods for gardens, fruits and vegetables from the garden, different souvenirs and food stands including stands with specially decorated gingerbreads. This event is organised every year on the first Saturday in October. This year on 6th of October. In Czech it’s called Cibulovy Jarmark. You will find Hořovice on the way to Plzeň about 50km from Prague. The event starts in the morning and lasts the whole day. You will see a lot of homemade and handmade products, vegetable, fruits, sweets and also ceramics, hand carved wooden objects and ironwork. There will be areas for children – carousels, see-saws etc. The place will be full of people, music and full of the noises of life. You can buy everything you see there, they are all Czech products of the best quality. Why an Onion Fair? Well the onion is the queen of our cooking. Onions can play a very important role in the care of our health too. The active substance in onion is called allicin – it acts as a natural antibiotic similarly to garlic. It is rich of all natural and vital vitamins and minerals. Cold, flu and coughs - you can use the juice from a fresh onion – cut the onion to small pieces and put about 2 teaspoons of sugar powder on it – in a short while the onion produces juice – use 1 spoon 4x daily and you will feel relief very quickly. And it tastes ok too. The same result can be achieved with onion tea – just cook the onion and drink the brew. There is a very old tale of how to defend the house from viruses from the outside during flu epidemic times - create a healthy decoration in you hall, entrance place or sitting room - just a plate of nice onions in one of these areas – it evaporates and kills viruses coming in with you from outside. So, you can see, that such a product of nature is always available for our advantage. So the first Onion Fair in Hořovice was October 12th 1989. 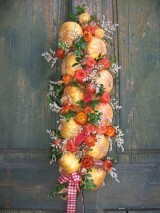 It was necessary to have the symbol of this event - onion plaits. We learnt how to make them in Weimar and in the beginning it was difficult to get the plait as a souvenir, but nowadays it’s everywhere. 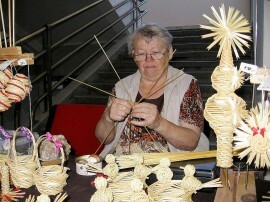 At the Fair, you can find many stands with onion plaits, so nobody will leave the Fair without this specialty. Also ti’s necessary to point out that Czech onion plaits are different to German ones, as the Czech ones are decorated with dried blossoms. 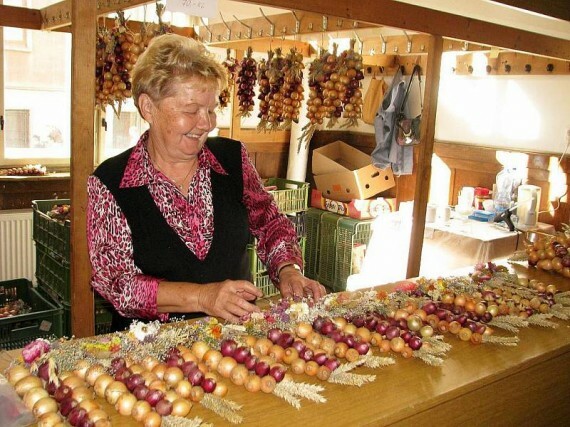 The first Onion Fair was a pleasant surprise for Hořovice and it’s surrounding villages so that today the Onion Fair is now a firm tradition and now in it’s 23rd year. In the last few years Hořovice welcomed more then ten thousand visitors from whole of the Czech Republic. The fair is organized by gardeners, so different exhibitions are taking place, such as exhibition of fruits, vegetables, medicinal plants, limes etc. Apart from that the bee-masters and mushroom pickers are also presenting their exhibits. 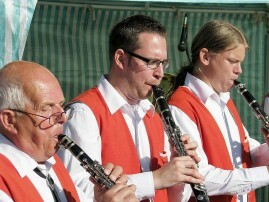 Just as important are the supporting cultural events, such as brass bands, country bands and drum majorettes. Entertainment for kids is also organised, mainly in fun parks with different attractions. Event of such a size needs perfect organisation which is all done by passionate gardeners in cooperation with Hořovice town. I hope the tradition of Onion fairs in Hořovice will continue in the future as it’s a fun countryside event perfect for this time of the year. 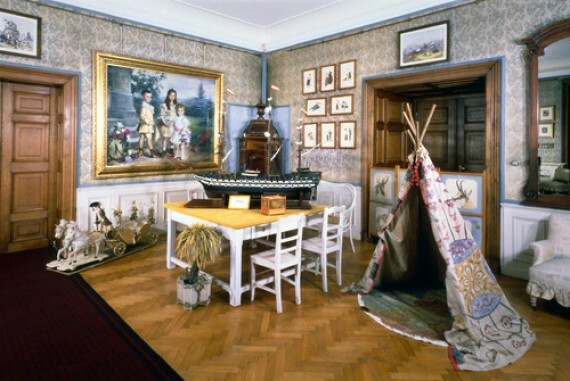 You can also visit the exposition in small Castle of Hořovice. There is an unique exposition of the costumes from TV film stories and the children’s plays of nobil children in their times.